The box that houses the firehouse bees and their new queen. If you recall earlier this summer there was a group of bees at a local firehouse I had been contacted about removing. (See Firehouse Bees). As time went on it became apparent that getting queen out of that wall was going to be harder than anticipated. I removed 3 or so pounds of bees, but the queen remained in the wall. The rest of that story is for a later post. A frame of eggs was added several weeks ago on 5/22/12. The hive was quite aggressive that day so I haven’t been poking and prodding around in there much. Daily observations have been made since then, waiting and hoping to see pollen entering the box. Finally Saturday morning I saw what I had been waiting for. Easy peasy indeed! Sunday 6/24 the hive was examined and there were eggs as well as some very young brood on one frame. The pattern seemed too regular for this to be the work of laying worker(s). I still cannot be sure until these cells get capped, but it sure appears to be worker brood. I had hoped to make this hive 1212, but this group is destined for a friend of my wife’s homestead. Approximately 5/4/2012 Trap09 caught one of the first swarms of the year. It was + for pollen entering and had good activity. On 5/12 it was hived and I noted that it was a very small swarm. One of the smallest ones I have ever hived. There was brood present, but again the size of the swarm was very small. My wife’s friend called a week or so ago and reported her findings after doing a hive inspection. Concerned, I checked them on 6/24 and found that virtually nothing had changed in the box since they were hived. Unfortunately I fear the number of bees left in there is not great enough for them to rear their own queen at this point. There just aren’t enough bees to cover an entire frame full of eggs and brood. If a swarm trap gets occupied in the next couple of weeks perhaps they can be added to that group. Otherwise the future is bleak for them. What do you think? What steps have you taken to salvage your queen-less hives? This entry was posted in Hive Reports, HowTo, Posts and tagged bee, beekeeping, Indiana beekepeing, Jason Bruns, Swarm. Bookmark the permalink. 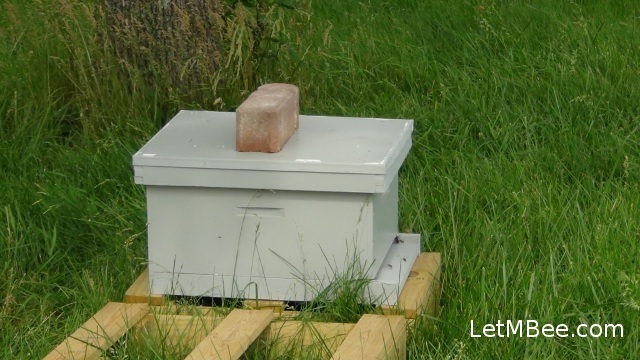 Is your firhouse hive doing well and a differatn hive is super small? Hard to follow whats going on here. Sorry for it being hard to follow. It made sense in my head, but perhaps not so much in writing. The firehouse hive is the one that I believe has the new queen and is doing well. I had hoped to make the firehouse group 1212. Instead I am going to give them to my wife’s friend. The contents from Trap #09 was very small and now has no larvae and or eggs. Some gift to give a new beekeeper to get them started. I will try to be more clear in the future. Happily, giving a frame of brood and eggs to queenless Hive 3 last year worked like a charm. This hive is very strong and wonderful. I guess all the factors have to line up even if you provide the bees with a brood frame. By no means do I claim to be an expert at it. It has been done around here once.